No Windows phone any more, but the Windows 10 Mobile instead! If you still have no idea on why and how to rip DVD to Windows 10 Mobile, this tutorial will present you the detailed reasons and steps of ripping movie DVD on Windows 10 phone with full featured DVD to Windows 10 Mobile ripper. The reason to recommend a DVD to Windows 10 Mobile ripper is that most of current DVD ripper can not rip all copy protected DVDs, just can rip partial ones. Microsoft has never stopped its efforts to gain ground in the mobile device market where iOS and Android together captured over 95% smartphone OS market shares in 2014. This time Microsoft have its new Windows 10 OS be available on smart phones may narrow the gap between Microsoft phone and other mainstream phones. At 2015 Mobile World Congress in Spain, Microsoft delivered us the first sign of two new Windows 10 based mid-market handsets - Lumia 640 and Lumia 640 XL. They are both shipped with Windows Phone 8.1 and can be upgraded to Windows 10 OS. 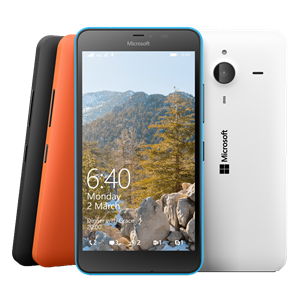 And in October, Microsoft unveiled new Windows 10 based mobile models - Lumia 550, 950/XL. Free download this all-in-one DVD ripper on Windows OS, be it Windows XP, Vista, and Windows 7/8/10, to rip DVD to Windows 10 Mobile, including copy protected DVDs with DVD CSS, region code, Sony ArccOS, Disney X-project DRM etc. 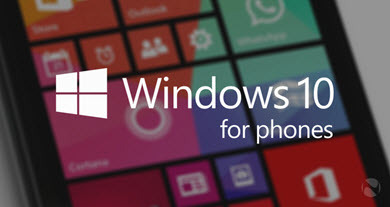 How to Upgrade Windows 10 for phone Supported Phones to Windows 10? According to the Microsoft official, this Windows 10 can be installed currently on Windows Phone models - Lumia new 950/XL, 550, and 630/635/636/638/730/830, which must have 8 GB storage at least. To work it out, you should firstly download the Windows Insider app, then sign in to join Windows Insider Program and follow the guidance to install Windows 10 TP for your phones. But NOTE that if you want try Windows 10 on our supported phone, you should back up all your useful and essential materials in case they are missing after installment of Windows 10. And since removing Win 10 OS and getting back the previous OS is a nerve-racking thing, it's not recommendable to install Windows for phones now unless you're serious Windows Phone aficionados or tech experts. What May Thrill You to Watch DVD on Windows 10 Mobile with WinX DVD Ripper Platinum? 1. Windows 10 Mobile newly support MKV, HEVC/H.265 and FLAC formats makes watching DVD movie on Windows 10 Mobile more vivid and immersing. WinX DVD Riper Platinum can rip DVD to 320+ mainstream formats at will and its output formats/devices will be continuously updated according to the users' needs and market changing. 2. Although Windows 10 Mobile can not play movie DVD disc directly, watching DVD on Windows 10 Mobile is a brand new audio-visual enjoyment with the help of WinX DVD Ripper Platinum. How to Rip DVD to Windows 10 Mobile Easily? 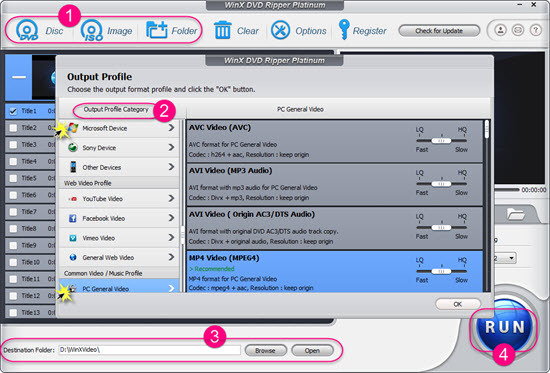 Download WinX DVD Ripper Platinum Windows version or Mac version right away. And the funtions of these two versions are almost the same except that Mac Version can backup movie DVD full title to MKV (all audios/videos/subtitles contained) while Windows version will soon do. Download WinX DVD Ripper Platinum - Easily and Fast Convert Rip any movie DVDs to Windows 10 Mobile on Windows/Mac. DVD Disc, ISO Image, DVD Folder can be analyzed. Click corresponding icon to on the left top to import DVD movie to ripper, and the whole progress will just take seconds. * Select Microsoft Device -> Microsoft WP8 Mobile device -> General WP8 Mobile Video. 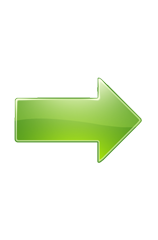 You can click "Browse" button to choose destination file saving folder. You can rip DVD to Windows 10 Mobile formats to your PC or connect Windows 10 Mobile to the computer and directly place converted DVD video to Windows 10 Mobile's sd-card. The whole DVD to Windows 10 Mobile ripping time may vary from file sizes. And ripping an average movie DVD takes about 25-30 minutes to an external hard drive. 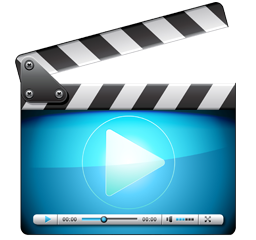 Best Video Downloader & Converter for Windows 10 - WinX HD Video Converter Deluxe: Built in hundreds of A/V codecs and equipped with YouTube Video Downloader functions. As all-in-one HD Video Converter software for Windows 10/8/8.1/7 and below, it helps you download and convert YouTube video on Windows 10 to MKV, MP4, H.265, AVCHD, M2TS, etc. Moreover, it's embedded with numerous profiles for Apple, Samsung, HTC, Sony, Microsoft portable devices, iOS, Android, Windows mobiles. * The developer only advocates ripping DVD to Windows 10 Mobile for personal use and suggests referring to the related DVD copyright laws before doing so. * Best Window 10 for Phone [PCAdvisor] - The 13 best Windows Phones you can buy in the UK.